For the moment there are three kinds of motion chairs. They are pneumatic system, hydraulic power system and servo motor system. The pneumatic chairs are of the lowest price, but the quality is not good enough. Chairs of this kind are fit for the use of large cinemas. Comparatively, the price of hydraulic chairs is moderate, and the quality is also favorable. These chairs, whose life is one to three years, are widely used in normal cinemas. The servo motor chairs are the most expensive ones, and of course, they are of the best quality. The structure of pneumatic chairs is simple and portable, so is its installation and maintenance. For reason that the pressure grade of pneumatic system is low, it is much safer than the hydraulic system. The working medium of this system is the air, which is inexhaustible and free of charge. It is pollution free but the electricity consumption is too much, and the energy conversion rate is very low. Generally, the initial cost is low but the utilizing cost is much higher. Meanwhile, the dependability of these chairs is not so satisfactory, and their working life is influenced a lot by the cleanliness of the air and the using frequency. The pneumatic chairs are of the lowest price, but the quality is not good enough. Chairs of this kind are fit for the use of large cinemas. The hydraulic seats adopt advanced controlling technology, including all the functions of normal 4D seats, and realizing accurate control of 6-degree of freedom. The using life of the products is extended, the reliability is much higher and the cost performance is therefore more advisable. The hydraulic seats have overcome problems of noise and energy consumption of pneumatic seats, and instability and inconvenience of maintenance of servo motor seats. The theater will be more energy-saving. Such kind of seats are more suitable for clients who use them for a long period of time. Comparatively, the price of hydraulic chairs is moderate, and the quality is also favorable. These chairs, whose life is one to three years, are widely used in normal cinemas. The servo motor is a machine system that converts electric energy into mechanic energy. The application and control of servo motor is very convenient. It has the power of self-starting, speeding up, braking, inversion, etc. So it can meet various operation requirements. The working efficiency of servo motor is quite high, and there is no smoke or smell. The noise is much lower than the other two types of chairs. with the best quality, the price is undoubtedly the most expensive among the three. 1. Lightning : While the movie shots, thunder and lightning, theater hall will issue a dazzling lightning, and accompanied by the roar of lightning, so that audiences feel like being at the thunderstorm days. 2. Raining : While the film for a rainy picture, showing the slightest fear of stirring up the hall Yuhua, which is installed in the hall on top of the spray device consists of computer-controlled to complete, audiences will feel truly about rain fall from the sky, moist his hair and cheeks. 3. Snow : Simulate snow. Snowflake function is efficiently and quickly acting to man-made snow Feifei triumphantly sky drift down the screen from top to bottom with snow. Snow on the screen and indoor snow mixed together, a sudden exposure to the audience, and he will be wrapped in silver makeup Su's world. 4.Smoke : Simulated burning smoke. Imitate a large number of burning smoke, smoke arises accompanied by "flames" as if the sky in the combustion. Simulated mist curls between clouds Piaowu in the audience. 5. Bubble : Generated bubbles fills the air of the reality. Quest in the undersea world and underwater, the divers, aquatic plants and animals due to the role of metabolism, will spit out a number of air bubbles from the bubble machine blowing bubbles in the theater of the drift, alienation between the audience and the theater every corner of the make theater in the lively atmosphere of mystery. 6. Hot drop : Simulating the bloody scenes of Nature Law of the Jungle, or excreta. A bird flew over their heads and in front of you while excreted; ancient battlefield, military athletic field, blood spatter, etc. Since lens occurs, 40 constant temperatures hot water in the form of large water droplets splash down in the audience, who can get unexpected effect. 7. Vibration : Simulates an impact. When the movie screen, an object lens and lens impact or landing such scenarios, the instantaneous seat vibration make the audience feel as if being in a virtual reality. 8. Spray, jet expansion : Seat is equipped with fog, gas nozzle. Usually, it’s used in parallel, and can also be used independently. This seat can be sprayed on the expansion into a different water spray and different gases. 9.Ear Wind : Hair behind your ear, so that audiences can feel the three-dimensional position of the stimulation and the authenticity of the environment. 10. Ear Sound : Seat back of the stereo speakers, in a particularly conditional sounds, the audience can almost feel the stimulation of special effects, as if something on your minds, right you are about to attack. Comparing to the past movies,dynamic seat is the unique feature of 5D cinema.in past movies,viewers always seat in the chair and enjoy the 3D movie in 3D space,now in 5D movie,the seat will move as the devleoping of the movie scene,if in the movie,someone drop into a hollow,the viewers in the 5D cineme will drop too on the seat,it will bring much thrilling real drop feeling to the viewers to let the viewers enjoy the same feeling like they are just in the movie,the other seat actions are same like this too. All kinds special effects are another unique features of 5D movie,the prinpicle is same with the seat action ,all the special effects,like the snow,rain ,bubble,flower smell and so on will be imitated like the ral world,for example if there is snow in the movie,the bubble machine in the cinema will work ,so the viewer can enjoy the snow too like the movie scene,it bring real snow feeling to viewers, it is not untouch ,you can grasp the snow now! The movie playing time is much cut down now.considering the hunman body ,such seat action and special effects can keep so long time ,viewers will feel tired in continuous vibration or waterfall,so small movie is very popular in such mode,the short movie will bring more income to onwers ,the playing time adds,playing cycle is very quick and need little time.currently ,the movie is about 5 mins to 15 mins. Now,it no need big space like the past ,before a cinema need about 200m2 or more,now a 15m2 room or a truck can help the cinema dream become true.everyong can be the onwer if you want,just installa the whole set cinema system in your small room or truck ,hire 2 persons to charge the ticket, the cinema can open,the high income of this business let the onwer get the investment back very quick.you are just the next owner. All kinds seat action and special effects will be synchronized with the movie scene,the centrol control system give the orders to all equipments of the cinema and let them work together to give super magical feelings to viewers.it is a movie revolution . 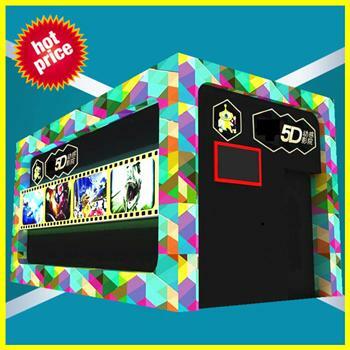 1, We have hydraulic 5D cinema, servo motor 5D cinema, Pneumatic 5D cinema. 2, we have Mini 5D cinema, if you don't want to come to China to learn, don; 't want to afford our engineer travel cost, mini 5D cinema is your right choice, it need no installation. 3, we have motion and special effect acquisition system, at present, insufficient movies is a big problem to run 5D cinema, our motion acquisition system can transfer 3D, 4D cinema into 5D movies, to solve this difficultiy. 5, Good technical support and service after sale.